McClatchy writer Bryan Lowry reported Wednesday that, “Pat Roberts isn’t ready to celebrate a deal on the farm bill, but he’s getting closer. Roberts, the Kansas Republican who chairs the Senate Agriculture Committee, said that he and the other three principal negotiators on the legislation have reached a tentative agreement on the bill and are now waiting on analysis from the Congressional Budget Office for a final bill. Politico writers Catherine Boudreau and Liz Crampton reported Wednesday that, “Senate Agriculture Chairman Pat Roberts indicated Wednesday that farm bill negotiators have reached a tentative agreement and were awaiting final cost estimates before making a formal announcement. Meanwhile, Washington Post writers Erica Werner and Jeff Stein reported Wednesday that, “Lawmakers have been at odds over a House GOP proposal to boost work requirements for food stamp recipients, but Sens. Pat Roberts (R-Kan.) and Debbie Stabenow (D-Mich.), the leaders of the Senate Agriculture Committee, said they had resolved the debate over the work requirements and other outstanding issues. “‘We have finally reached a point where I think we’re very close and very encouraged,’ Republican Senator Pat Roberts from Kansas, who heads the Senate’s Agriculture Committee, told reporters. On Thursday morning, DTN Special Correspondent Jerry Hagstrom reported that, “House Agriculture Committee Chairman Michael Conaway, R-Texas, said late Wednesday that he and the other agriculture committee leaders have reached an ‘agreement in principle’ on the farm bill, but there are more details to be worked out. “‘I am excited about the progress that has been made. We’ve reached an agreement in principle, but we’ve got more work to do. I’m committed to delivering this important win to rural America,’ Conaway said in an email to DTN. Prior to Wednesday afternoon’s developments, McClatchy writers Bryan Lowry and Emily Cadei reported Tuesday that, “An increasingly fierce debate about how to prevent deadly wildfires in California is threatening to endanger crucial crop insurance for farmers in Kansas and Missouri. Tuesday’s article noted that, “Environmental groups and many Democrats are staunchly opposed to the Republican-backed forestry measures, which are included in the version of the farm bill the GOP-led House passed earlier this year. And Democrats — who can block the legislation in the Senate — are not willing to concede much. ‘What the House has proposed on forestry would kill the farm bill,’ Sen. Debbie Stabenow, D-Michigan, top Democrat on the Senate Agriculture Committee, warned Tuesday. Lowry and Cadei explained that, “The House plan would enable the Forest Service to expedite forest management projects to prevent catastrophic wildfires, according to House GOP aides. “Rep. Roger Marshall, R-Kansas, a member of the House Agriculture Committee, said in an email that failing to include the provisions ‘would mean the continued mismanagement of forests which, as we have seen in the recent devastating fires, can have drastic consequences,'” the article noted. California is still trying to recover from wildfires—but members of the House GOP are trying to politicize this tragedy to get a sweetheart deal for big timber lobbyists. No way! It's time to move ahead with a clean Farm Bill, which includes strong funding for the Chesapeake Bay. Stabenow said she, Senate Agriculture Chairman Pat Roberts of Kansas, and House Agriculture Chairman K. Michael Conaway of Texas, and ranking member Collin C. Peterson of Minnesota have a handful of other issues to finish up including federal payment limits of farm subsidies. Politico’s Morning Agriculture reported Wednesday that, “With Senate and House members back in town Tuesday, high-level farm bill negotiators met throughout the day to try to resolve nettlesome policy disputes still holding up a final conference agreement. “Senate Ag Chairman Pat Roberts (R-Kan.) said congressional leaders discussed issues like forest management and wildfire prevention, which has emerged as a major sticking point late in the talks — especially after the deadly blazes in California. 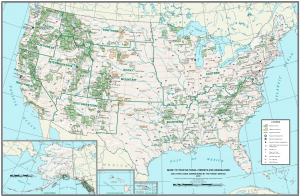 A Guide To Your National Forests. 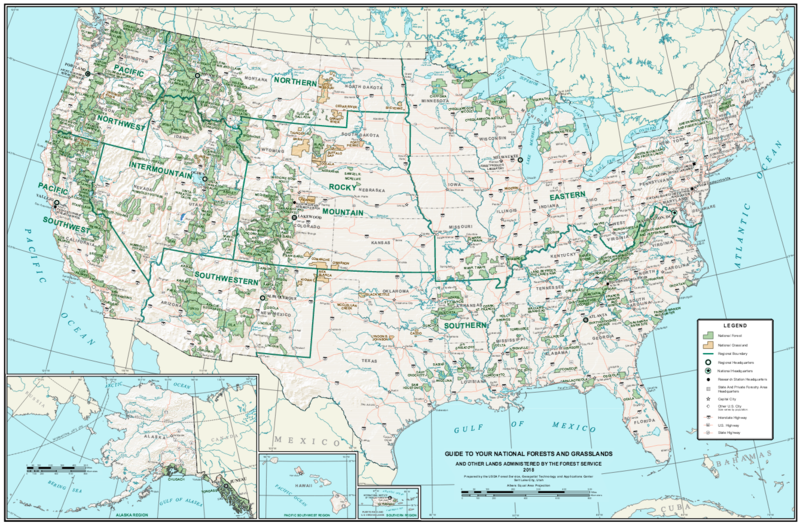 USDA- U.S. Forest Service (https://goo.gl/dtFTHA).